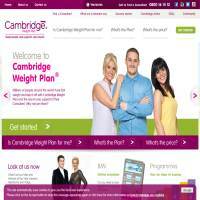 The Cambridge Weight Plan is primarily a UK service although they also have a worldwide website. They offer a two-part solution to being overweight: firstly, they provide calorie controlled meals and snacks to help you through your diet. Secondly, they provide support in the form of online forums and a 1 on 1 consultant. The idea is a simple one: lose weight through eating more healthily and keeping motivated through talking with a consultant. The food ranges from healthy nutrition shakes and bars, to regular meals such as spaghetti bolognaise and puddings. The site provides plenty of information about each of its food products, including the ingredients and nutritional information. Many of the items can be purchased through your consultant, or you could try to make your own recipes and mix it up with their products. The dishes look appetising and it doesn’t sound as though dieters go too hungry on the plan. Rather than massively reducing the amount of food you eat, it’s all about choosing the right foods and making sure you’re nourished. Shakes, soups, bars and more also have special options for people who are intolerant to particular ingredients, such as milk. You can search through CambridgeWeightPlan.com’s catalogue of consultants to find one who suits your personal approach to dieting. Each consultant has a profile page with details of their outlook and approach, and you can locate ones who live relatively near to you. These people have often been through the weight loss plan themselves, so understand what it’s like and how to succeed. The online community is primarily based around the site’s forum pages, which are used fairly regularly but aren’t quite as buzzing as we might hope. Still, they’re visited enough that any questions you have ought to be answered within a couple of days. The site has little in the way of fitness information, although you can find members talking about working out on the forums. There are also very few tools, such as online food diaries, which might make it a bit harder to track what you’ve eaten each day. However, paper versions of these tools may be available through your consultant, so it’s worth asking about any additional tools you require. The CambridgeWeightPlan offers good value for its products and consultations. Whilst it doesn’t have many online tools, the basic system does seem to be successful. We like the fact that the consultants have often been through the program themselves, adding a real human element to the experience of losing weight through them.